Lier XD: Terra Nova Review: Time Travelling Dinosaurs. Terra Nova Review: Time Travelling Dinosaurs. The show starts off with text on the screen sstating the premise of the show. AT THE DAWN OF THE 22ND CENTURY. THE WORLD IS ON THE VERGE OF ENVIRONMENTAL COLLAPSE. MANKIND’S ONLY SURVIVAL LIES 85 MILLION YEARS IN THE PAST. We are shown a futuristic apartment in a smog-filled city. It might have been Beijing or Shanghai or something. There’s a character walking inside the hallways wearing a futuristic air filter. Oh no. The air is so toxic that you can’t just breathe the air outside! The first 5 minutes of the show just keeps hitting the viewer on the head about how terrible the future really will be. Consumerism and High-Tech gadgets are pretty much gone, except for the occasional super thin ID cards. The dad goes inside his apartment and shows his family the wonder of an orange. Apparently they’re so rare that it’s been years since some of them have seen one. The mom name-drops that respiratory diseases have risen recently, probably due to the poor air quality. So, the police come in and say they have to search the house. In the future, one person can only have one offspring. They have three. The police finds the third child (named Zoe.) and the dad is put in jail. For twelve more minutes, we see the dad try to solid snake his way out of prison and to the Stargate facility. In the end, he makes a mad dash towards the portal. 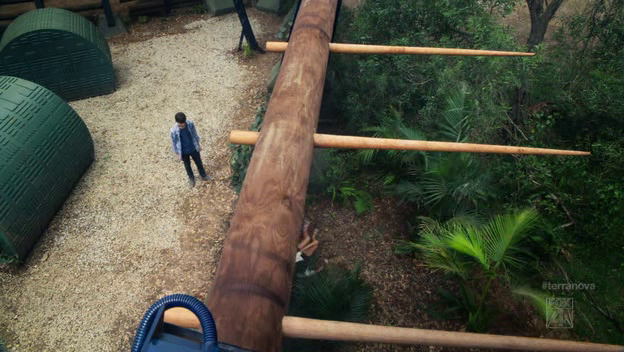 In the two years, the mom found a way to get the family into Terra Nova and travel into the past because she’s a doctor. Even though she can have a good life, she doesn’t want her kids to stay in a dying world! The bad thing is that the dad(Jim) has to stay in prison, and Zoe can’t go. The first sixteen minutes of the show has been entirely superfluous. Honestly, if they excised it, the pilot would probably be better. I don’t think they had enough budget, time, or imagination to create the world of 214X well enough. Everyone is living in squalor… in a dying world. They don’t outright say what caused the environmental collapse. I hope it isn’t just pollution or ‘global warming’. Anyway, there’s enough dialogue after the jump in time to describe the future. There’d be more mystery and would have probably been better. So the Terra Novan colony has existed for 7 years now. They quickly explain that this is an entirely new timeline so they can kill dinosaurs or whatever they want without causing any causality problems. 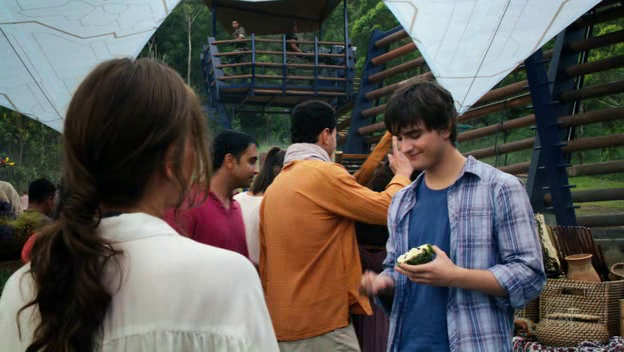 Characters make the comparison about the lush environment compared to the dark/gloomy/perpetually cloudy environment. I can understand things like “The air is so fresh!”, but things like “I’ve forgotten what the moon looks like”, or “the sky is so blue I’ve never seen.” is bizarre. Are there no television programmers in the future about what the past is like? Minor complaint. When the family and the rest of the expedition arrive at Terra Nova, the dad is assigned to agriculture duty. The youngest daughter Zoe finds some brontosaurus which was right on the other side of the fence. 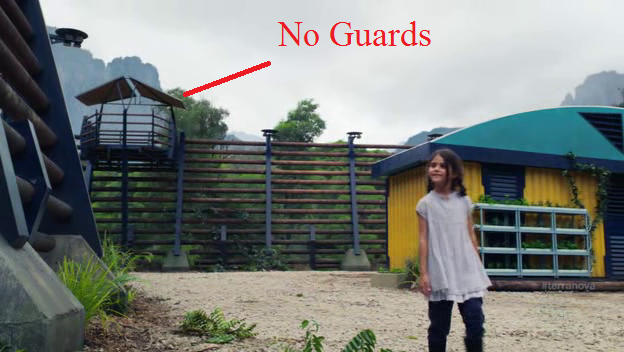 Nice job keeping dinosaurs away, security. It was one of those Jurassic park moments, and I guess it was absolutely necessary. Doesn’t mean it makes sense in-universe. The main conflict of this episode revolves around Josh (the son) hanging around female love interest (Sky) and engaging is some incredibly dumb shenanigans. They decide to go into a restricted zone to jump off a waterfall. They also decide to go make alcohol in an area with dangerous dinosaurs. On their way back to the camp, they were ambushed by dinosaurs. That’s such an unforeseeable plot twist! Oh, Sky shows Josh some strange cave markings, and then makes him promise not to tell anyone about the cave markings. Yeah, like that won’t be a plot point in the future. The other plot point involves the doctor wife healing a man who was supposed to be a thief. Turns out that the guy is a “Sixer”, which is a group of people from the sixth pilgrimage who have since left the main group and found their own colony. The thief breaks out of the hospital laughably easily, and then proceeds to try and assassinate Taylor, the leader of Terra Nova. Why nobody at the hospital decided to inform security (to warn Taylor or anyone), I don’t know. Probably just bad writing or something. Jim stops the plot and becomes a new cop. They go for a ride outside the gate and spots the Sixers riding towards the camp. 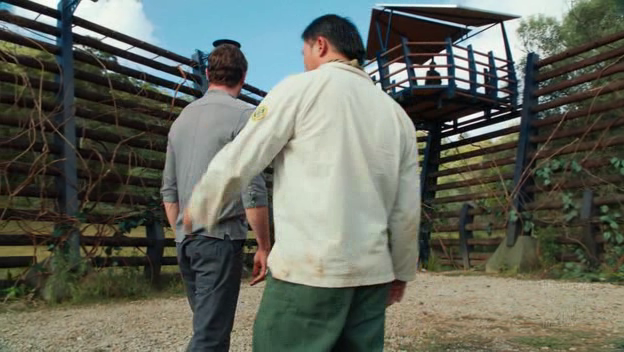 They’re here to exchange some ‘meteoric iron’ for the prisoner and some supplies. The Sixers have a hidden agenda and are led in part by Taylor’s son. Apparently Taylor’s son is the one making the cave markings which will be the key to controlling the future. The retarded teenagers and the sixers storyline intersects when the sixers were murdered on their way back to the their camp. The teenagers find their vehicle and hides inside it when dinosaurs come. They are rescued by the end of the episode. Right as they’re getting away from a dinosaur. Two guards chilling at a tower. Security perimeter is so poor that people can just crawl outside the gate. If jurassic park taught me anything, is that there are small killer velociraptor everywhere. No guards at all. I guess that's why the little girl was able to feed the brontosaurus some leaves. What I don’t like about the show, which probably won’t improve as it goes on, is that the military/security of Terra Nova is so absurdly terrible. 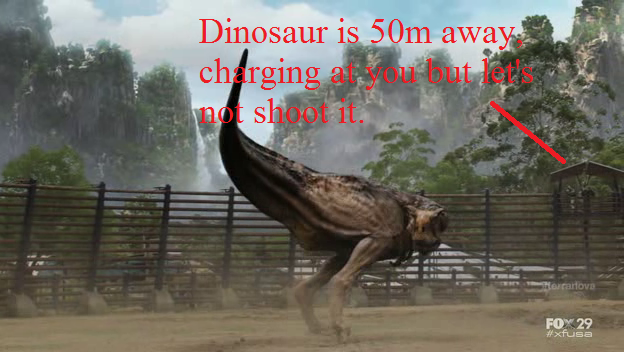 We have areas where there are absolutely no guards while dinosaurs roam nearby. We have guards that don’t know to fire a weapon until ordered by the main characters. We have (farm) areas which are not within the perimeter of the colony. Terrible planning, guys. Also, I refuse to believe that 130 years from now, humans won’t have weapons that would simply shred dinosaurs apart. Even in an environmentally collapsed Earth, you just know that hoards of money will be spent developing even more effective weapons of war. It’s a pilot episode. It’s not very good at all. I have a feeling this show is going to be a lot like Falling Skies… except that Falling Skies doesn’t have as dense of characters as here. The teenager plot reminds me a lot of Tyler from V.
Is this show worth watching? I wouldn't say so. There's not really anything here that's done particularly well. There's better things to do with your time. Go watch Breaking Bad, or Fringe, or Supernatural. Go back and watch SGU or Alphas. I am curious to see what kind of storyline they can do to sustain a full season.